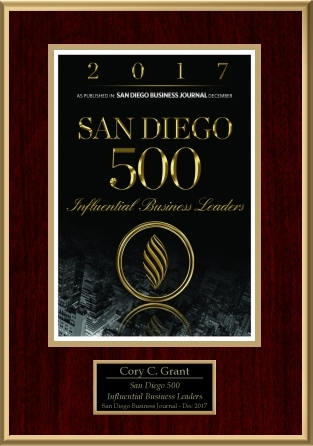 For over 20 years, Mr. Grant has developed his expertise in the design and implementation of advanced estate plans, wealth protection techniques, executive retention programs, and business succession strategies for families, privately-held businesses, and non-profit organizations. He has been an active member of the California State Bar since 1994. Among Mr. Grant’s specialties are creating intuitive succession and retention plans for companies and families with investment real estate holdings. In addition, he creates innovative approaches to life insurance premium financing and estate planning with large retirement accounts. Mr. Grant also advises non-profit organizations on executive retention strategies, and methods to protect and grow charitable contributions. Mr. Grant serves on the board of trustees for the San Dieguito Boys & Girls Club Foundation, The American Institute for Musical Studies (AIMS), and is a former member of the board of The Del Mar Foundation. He is a member of the Executive Committee at the Burnham-Moores Center for Real Estate at the University of San Diego, and also provides pro bono advice on planned giving to the U.S.S. Midway Museum and Palomar College. Mr. Grant is the author of two books, Tax Deferred Investing (Wiley, 2000), and Estate Planning is About More Than Death and Taxes (Wiley, 2005). His new book on business succession is due out in late 2017. Mr. Grant frequently speaks at estate planning and investment conferences. He was also a recent speaker on the topic of estate planning on NBC Early Today. A veteran of the life insurance industry, Mr. Grant is a lifetime member of Million Dollar Roundtable (MDRT) Top of the Table, and the American Association of Life Underwriters (AALU). He actively consults with life insurance companies on the topics of product design and pricing.